If you fancy a break from the iOS and Android duopoly, and Windows Phone and BlackBerry just aren't doing it for you, you may like to take a look at the upstart Jolla Sailfish smartphone. The handset, running the Sailfish OS which began its journey within Nokia as the never-truly-realised MeeGo software, is now available to buy in the UK and most of Europe, from the official web portal. The modestly-specced handset, which arrives packing a 4.5-inch 540 x 960 display and a 1.4GHz dual-core Snapdragon processor, can be had for €399 (around £331). There's also 1GB of RAM, an 8-megapixel rear-facing camera and a 1-megapixel front facing camera, so it's certainly not a Nexus 5 contender in terms of a value-for-specs comparison. However, despite the mid-range specs, a reasons more folks may be willing to consider the Sailfish-running handset over more moderately priced rivals is its ability to run Android apps. It is using the Yandex app store, which holds over 85,000 Android titles, while there's also plenty of native Jolla apps to choose from. Those ordering the device will have to wait a while to get their paws on it before Santa arrives as delivery estimates currently sit at 3-4 weeks. Can Jolla oust Ubuntu or Samsung's Tizen in the battle of the upstart mobile operating systems? Let us know your thoughts in the comments section below. 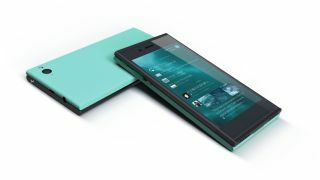 Jolla on Jolla: How it could do what Nokia couldn't.